Project title The title of the project as it appears in the project drop-down menu in Media Factory. If you only have one project, you can't see the drop-down menu. Media moderation Sets the overall rule of whether to ever show unmoderated content in an application. It is recommended to set this to Post, since this allows more flexibility in the application. Media moderation email Sets the overall rule of whether to ever send moderation email. If you intend to send moderation email - when media is approved or denied - set this to Send by default. Media moderation email - Approved / Denied This the email template that will be sent when ANY MEDIA is approved or denied. This should be set to None. 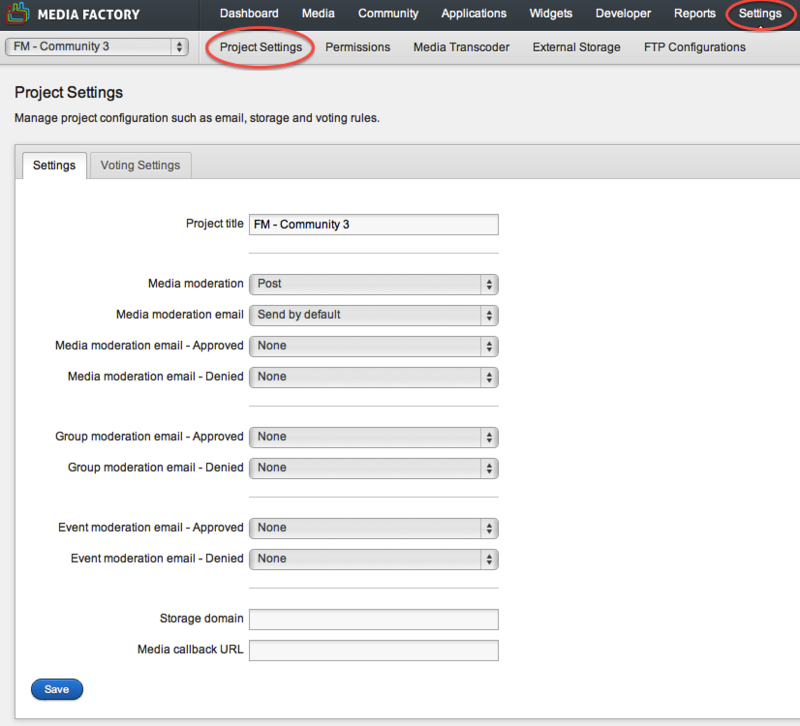 You should set email templates on the channel configuration page, so that you can specify different emails for content uploads and comments. Group moderation email - Approved / Denied This the email template that will be sent when ANY GROUP is approved or denied. You probably won't send these types of emails with the Media Community, so leave it set to none. Event moderation email - Approved / Denied This the email template that will be sent when ANY EVENT is approved or denied. You probably won't send these types of emails with the Media Community, so leave it set to none. Storage domain These needs to edited if you are using a CDN to deliver your media. Media callback URL Some actions like approve and deny can trigger an XML payload to be posted to this URL.